Optimise spending and analyse opportunities for virtualisation or data centre expansion with Dell EMC Live Optics (previously Dell DPACK) —cloud-based IT infrastructure planning and collaboration software. This hardware- and platform-agnostic analysis service records workload characteristics, measures performance and creates simulations from various industry-leading platforms. Reduce the guesswork involved in data center expansion and troubleshooting with a Live Optics analysis, which typically takes 24 hours or less to complete. Live Optics works non-disruptively in Windows, Linux and VMware environments; customers typically allocate approximately 24 hours for data collection. 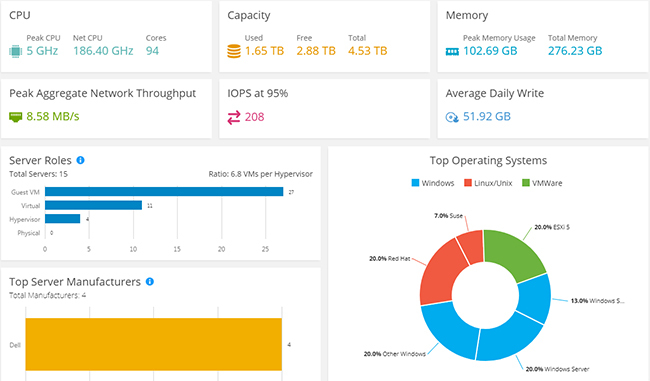 The Live Optics Collector runs remotely and is agentless, gathering core metrics such as disk I/O, throughput, free and used capacity, and memory utilisation. Then Live Optics produces an in-depth analysis of server workloads and capacity requirements to help optimise datacentre operations and expansion. Get started with Live Optics (Formally Dell DPACK), a platform-agnostic data center analysis service at no cost — to help you understand your environment, optimise IT investments and evaluate growth opportunities.